Spitfire Audio enter deep symphonic waters with their latest string library. 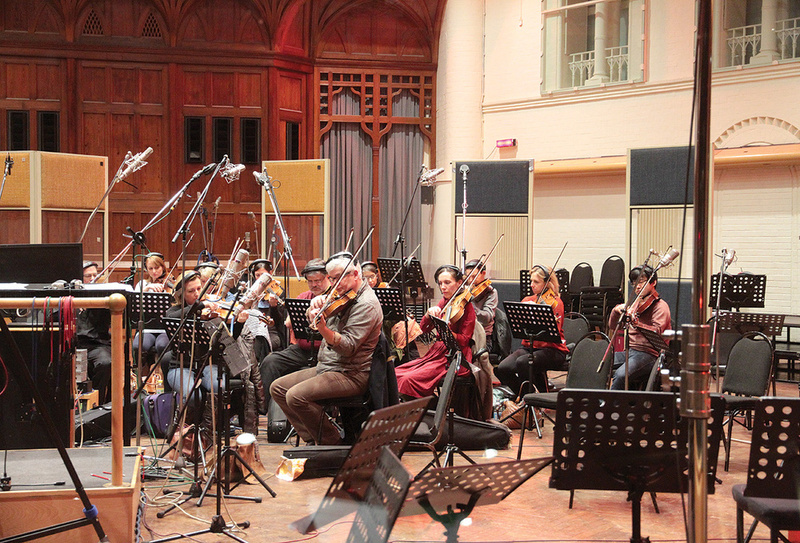 Let’s face it, recording a symphonic string section is beyond most people’s means. Once you’ve factored in studio fees, a single session with a full–sized group would cost about as much as buying a small house in Bulgaria. Apart from robbing a bank, what’s a cash–strapped media composer to do? Spitfire Audio have a solution: buy their Mural Symphonic Strings sample library and you can have 60 of the UK’s finest string players sitting on your hard drive, ready to do your musical bidding 24/7 for the current price of a 32GB Apple iPad Air. If you’re worried about how this impacts on session players’ livelihoods, a consoling thought is that Spitfire pay their musicians a voluntary royalty from sales. At the time of writing, Mural is available in two separate volumes: the first contains essential articulations (including true legato samples), while the second adds more fundamental styles such as trills, effects and legato portamento slides. There’s no duplication of sample content across the two volumes, but the additional legato articulations in Volume 2 won’t work unless you already have Volume 1 installed. That apart, anyone considering using Mural as their main string library would be well advised to start off with the first volume, since it alone contains the meat–and–potatoes styles necessary for general string writing. Unless you’re only interested in some of Volume 2’s more specialised articulations, purchasing it first would be like buying the wallpaper before you’ve built the wall. Mural Volumes 1 and 2 are available only as downloads (33.5GB and 30.6GB, respectively) from Spitfire Audio’s site. Both require the full version of Native Instruments Kontakt 4 or 5, and will not run on the free Kontakt Player or in any other sampler format. Since their recording conditions and presentation are identical, you can freely mix and match patches from the two collections: this is explored in Volume 2 in the shape of combination patches incorporating samples from both libraries. The dozen or so articulations played by Volume 1’s string sections cover familiar territory, but one exception is the ‘sul ponticello’ (bowed on the bridge) style: this thin, icy timbre has a slightly menacing atmosphere, and when played by the double basses it takes on a kind of muted Arctic grandeur. A more conventional sense of threat is conveyed by the tremolos, particularly when you start quietly and slowly increasing their volume; unfortunately tremolos aren’t played by second violins and violas in this volume, but the other sections’ tremolo performances are excellent. Looped, three–dynamic vibrato and non–vibrato sustains (‘longs’ in Spitfire’s parlance) are played with and without mutes, and both options sound luxuriant and expansive: the muted ‘con sordino’ patches are particularly opulent, and being real, separate performances rather than a filtered version of the unmuted samples, you can layer them with non–sordino patches to excellent effect. I found that a three–way unison layering of con sordino first violins, second violins and violas produced an amazingly sheer, lush symphonic texture. Mural’s Overview panel, showing a large template which combines articulations from Volumes 1 and 2.In a similar vein, the ‘flautando’ sustains’ gorgeous breathy tone is especially attractive in the low register, and I was also taken by the soft, emotional quality of the basses’ harmonics. This playing style is hard to control in real life, and so benefits from being sampled and tamed! For some reason the cellos harmonics patch (which sounds great played chordally) was silent when first loaded. If you experience the same problem, click on the ‘tree’ miking icon on the GUI to re–load the samples, then re–save the patch. Like all contemporary orchestral libraries, Mural features mod wheel–controlled dynamic cross–fading for its long notes. Spitfire have totally nailed this technique: swells and fades sound smooth, natural and in tune, a great way of adding expressive, subtle (or otherwise) dynamics to your parts. And that’s just as well, as Volume 1 contains no played crescendos or diminuendos. Interval–based legato sampling is a strong point: I very much enjoyed Volume 1’s ‘fingered legato’ patches, in which both violin sections turn in positive, vivacious performances, the viola players throw caution to the wind and the low strings combine strength, elegance and lyricism. My only complaint is that in the review copy, the violas’ legatos didn’t work properly on upward major seventh and octave intervals in the G4 to Bb4 range. Spitfire’s Pest Control team promise this bug will be exterminated in a free update. Mural’s Kontakt GUI ‘Expert panel’, showing a ‘light’ palette of four articulations, the five–way microphone mixer and various controllers. Select the articulation you want by pressing one of the pink keyswitches.A word on the low strings: superb. Layering cellos and basses in octaves gives the classic, instantly recognisable orchestral low strings sound, highly effective for sustains, legatos and spiccatos. I’m sure that as I write, this great, sonorous noise is being pressed into service in several UK TV music scores! If you want to try it yourself, load the cellos and basses ‘Long’ patches, select the basses patch, click on the little ‘spanner’ icon on the left of the GUI in a yellow box and set Transpose to –12 semitones. On with the shorts (as we tennis enthusiasts say). As is often stated on these pages, media composers need tight, biting short–note string articulations for their tense action scenes, and Mural’s spiccatos are well up to the mark. As well as being just the ticket for accompanying movie mayhem, they also shine playing a fast–moving JS Bach piece in one of Spitfire’s product demos, and Stravinsky himself would have admired their rhythmic incision and precision. From time to time I earmark certain sounds which I know will inspire me to compose. Such a sonority is Mural’s low strings playing pizzicato in octaves: the combined effect of the weighty, elephantine string plucks and Lyndhurst Hall’s misty, wafting ambience is awesome. The snappy ‘Bartok pizzicato’ style also gets a look–in, along with some nice, clacky ‘col legno’ bow hits, but neither style is played by the second violins and violas, you need Volume 2 for that. Mural’s interval–based legato patches have their own dedicated controls.The enticingly named ‘Time Machine Short notes’ patches use Kontakt’s time–stretching algorithm to artificially alter the length of spiccatos, pizzicatos and col legno samples via a ‘Stretch’ fader on the GUI. This would be helpful if you need exaggeratedly short spiccato notes or an ultra–brief pizzicato stab. My only complaint about Mural Volume 1 is the lack of certain articulations for second violins and violas, which has resulted in the second violins ending up with only five playing styles. Most of these omissions are put right in Volume 2, but if Volume 1’s contents really are ‘essential articulations’ (and most would feel that tremolo is exactly that), then they should be provided for all five sections — especially at this price. Once you get hooked on Mural Volume 1’s ‘wall of sound’ (geddit? ), you’ll probably want to branch out into more decorative performance styles, and there a tasty selection in Mural Volume 2. As well as supplying tremolos for second violins and violas, Volume 2 adds vibrant, two–dynamic trills for all sections. ‘Measured tremolos’ are fast, repeated 16th notes played in a choice of 150 and 180 bpm fast tempos. The latter is pretty hectic, but by simply clicking on a button on the GUI, you can make these patches sync to your host tempo. That deactivates the sample loops, revealing that in real life the players galloped along for two bars of 4/4 before ending on a final short note. Use these samples for exciting rhythm passages (obviously), but also for injecting rhythmic energy into a melody line. I had a whale of a time playing the ‘FX’ patches. The effects samples fall into two distinct, drastically contrasting categories: in the red corner, a set of wild, screeching upwards and downwards glissando slides, suitable for all manner of unhinged musical madness and particularly scary when played by the basses. In the blue corner, some beautiful, gentle, evolving and subtly swelling non–vibrato sustains with a hint of sul ponticello in the bowing. Spitfire call the latter samples ‘Tense’, but I found them to be quite relaxing — a lovely strings texture to play over. In the same vein, no–vibrato, muted sul ponticello samples have a dreamy, detached and pleasantly synthetic quality which is very effective in the high register. The first violins’ ‘sul tasto’ (bowed over the fingerboard) style is also beautifully delicate, producing a silvery, ethereal tone that the makers uncharitably describe as “timid, naive and heartbreaking”. An exasperated record producer once described a well–known singer’s studio performance to me in similar terms, though I recall he used rather more robust language. Returning to the violence and mayhem, the ‘sul pont distorted’ articulation is a gutsy, rough–edged noise made by vigorously ‘digging in’ the bow over the bridge: the first violins’ rendition of it sounds like the Devil’s Hoedown, while the basses’ effort manages once again to sound frighteningly dramatic. The entertainingly named ‘Close Mic Pan Collapser’ allows you to reduce the stereo width of the Close mic position down to mono prior to panning it.In addition, there are straight long and short notes designed to supplement those in Volume 1. ‘Molto vibrato’ sustains feature the passionate, intense ‘espressivo’ style which is a staple of romantic string writing; combination long–note patches fuse those samples with Volume 1’s medium–vibrato sustains, the ‘molto vib’ guys taking over at high dynamics. Cross–fading between the two produces a satisfyingly huge volume surge. Shortish notes of 0.5 and one second duration can be used for medium–paced melody lines, or shortened into more staccato deliveries via Kontakt’s Time Machine. Mural Volume 2 introduces two new legato styles for all sections except the basses (an omission that will be put right in a free update). The ‘bowed legato’ articulation has a distinct bow attack on each note, giving melody lines more emphasis while retaining the legato smoothing effect between notes. I can imagine using this articulation in a soaring theme accompanying a movie’s opening credits. The ‘legato portamento’ articulation introduces a lovely pitch slide between notes: use it sparingly for occasional, impassioned octave leaps, or liberally to unleash the wonderful ‘Bollywood Strings’ melodic style, a joyful and exuberant sound to melt the heart of the most grim–faced UKIP voter. As far as I can tell, the speed of the portamento slides can’t be altered by users, but I found it to be perfect the way it is. The three legato options in the two volumes sound uniformly great, and the portamentos are among the best I’ve heard. Playing ranges are generously wide, and the violas positively sing out in the upper register. Only one caveat: as mentioned earlier, the Volume 2 legato patches won’t work without Volume 1 installed. The Velocity Curve control determines instruments’ dynamic response to touch. Four preset curves are available.Space doesn’t permit more than a cursory glance at Mural’s innumerable technical features, but dedicated tech–heads can download the manuals from Spitfire’s product pages and pore over the fine details. In short, MIDI CCs can be used to control vibrato on/off, release duration, legato interval speed and legato attack intensity. A new ‘Tightness’ control (CC#18) globally trims off the initial, almost subliminal attack of notes, resulting in a more immediate rhythmic response. A new Mixer Menu also adds some handy facilities, though its graphic controls are so tiny you might easily overlook them! While its great to have these features to hand, most people will be happy to play Mural’s patches as they stand and never bother to investigate the library’s user–customisable features. Nothing wrong with that, and happily, these patches do sound great straight out of the box. Mural is part of Spitfire’s British Modular Library (BML) range, which includes Sable, a deeply sampled, four–volume chamber strings group initially released in February 2013. The makers say they intend to expand Mural along similar lines to Sable, with new articulations set to include fast legatos and run–making patches. All instruments in the BML range are homogenously recorded with correct orchestral positioning in order that they can work together instantly as a unified group. Also available in Spitfire’s BML series are individual flutes, trumpets, trombones, low brass and French horn section titles, with further woodwind releases in the pipeline. Add Spitfire Percussion to the mix (see the SOS review at www.soundonsound.com/sos/feb11/articles/spitfire-percussion.htm), and you have the makings of a complete orchestral sample library recorded with British musicians at Air Studios, a prospect many orchestral sample users will view with relish. Spitfire have been here before: back in 2008, their bespoke ‘Symphonic Strings’ library also featured large string sections recorded at Air Studios, but that collection was only made available to a limited number of invited licence–holders, which felt like the musical equivalent of a gated community. Boasting larger low strings sections, a choice of mic positions and an enhanced set of technical features, the all–new Mural Symphonic Strings opens up the gates and invites in the riff–raff — sorry, I mean the general public. Given the title of this excellent sample collection, I felt it my journalistic duty to work a few wall–related puns into this review, but failed utterly when it came to finding a suitable ‘graffiti’ metaphor. That’s probably because if there was any writing on Mural’s wall, it would be executed with an artist’s brush, rather than sprayed out of a can. This is quality stuff: an enjoyable, sonically rich, beautifully performed celebration of British musical artistry, and another brick in the wall of Spitfire’s expanding orchestral empire. Few orchestral strings libraries enlist such a large cast as the 60 performers featured in Spitfire Audio’s Mural. Two notable exceptions are East West Hollywood Strings (312GB) and Vienna Symphonic Library Appassionata Strings (total 19.4GB), which feature 57 and 56 players respectively. Other high-quality, all–in–one string ensemble collections include the 254GB Berlin Strings, Cinesamples Cinestrings Core (50GB) and Cinematic Strings 2 (38GB). If the lack of second violins doesn’t bother you, 8Dio’s Adagio series (available as separate violins, violas, cellos and basses volumes, these total approximately 160GB) and Audiobro’s LA Scoring Strings (24GB) both offer flexible section sizes and also contain solo instruments. At the time of writing, Mural Volumes 1 and 2 feature five microphone positions: Close, (Decca) Tree, Ambient, Outriggers and Leader. New in this library, the last position is a mono spot mic trained on each section’s principal player: it carries discernible spill from the rest of the players, but the bleed is considerably quieter in the low strings, which means that you can use the Leader mic to do a reasonable facsimile of a solo cello or double bass. This miking can also be used to add overall definition, and sounds particularly effective when mixed in with the outrigger and ambient signals. Spitfire plan to release additional Stereo, Close Ribbon and Gallery mic perspectives for Mural: the first features a more direct, immediate sound and the latter, very distant, miking shows off the hall ambience to full effect. Recording engineer Jake Jackson has also created three custom mixes, two in the classic cinematic/symphonic mould and the third optimised for pop. Mural’s five string sections were recorded in situ, with first violins positioned to the left of the stereo image, second violins and violas respectively slightly left and right of centre and the low strings appearing on the right. If you’d like to reposition a section, Spitfire have provided a control for the Close miking which enables you to reduce its stereo width and pan the narrowed signal anywhere you like in the stereo picture. It would be nice to see this feature extended to all the mic positions, starting with the Decca Tree! Spitfire Audio believe the keyswitch method of changing articulations used in most orchestral libraries has become outdated, and should be replaced by a MIDI CC (continuous controller/control change) system. There are compelling arguments for this: the MIDI notes used for keyswitches mess up the look of your score notation, and you have to roll sequences back before the keyswitch occurs to select the correct articulation for a passage. Most DAW’s can chase CC commands, which gets round the latter annoying problem. In an attempt to unify articulation switching across Spitfire’s entire product range, the company has devised a system called Universal Articulation Controller Channel (UACC, pronounced ‘you–ack’). UACC uses CC #32 as the default controller. Like all MIDI CC numbers, it has 128 possible values, and Spitfire have suggested articulations for most of them: CC32 #1 is ‘generic long note’, CC32 #11 is ‘tremolo/flutter’, CC32 #47 is ‘staccatissimo’, and so on. I also noticed ‘disco upwards (rips)’ and ‘disco downwards (falls)’ listed, a possible indication of a new musical direction! The UACC standard is a work in progress, and Spitfire hope others will adopt and finalise it. If you’re tempted to use this system for your orchestral template, you can see the whole specification at www.spitfireaudio.com/uacc-a-new-proposed-standard.html, or download it from http://spitfire–webassets.s3.amazonaws.com/pdfs/UACCv2spec.pdf. Features 60 of London’s top string players. Section sizes are as large as they come. Recorded in Air Studios’ Lyndhurst Hall from five mic positions. Great performances, sound and ambience. Not cheap, but this is Savile Row quality, not Old Kent Road. Mural Volume 1’s second violins and violas lack certain articulations. Size is a factor in the orchestral world, and the large sections and spacious Air Lyndhurst Hall sound of Mural Symphonic Strings are certainly scaled for the big screen. Taken together, its two volumes deliver a great array of highly usable performances (including true legatos), the recording quality is fabulous and multiple mic positions make surround mixing a doddle. It’s not cheap, but if you take the plunge with Volume 1 you’ll soon be thinking about saving up for Volume 2! Mural Volume 1 & Volume 2 £478.80 each including VAT. Mural Volume 1 & Volume 2 £478.80 each.